3 Bedroom Semi Detached House For Sale in Stockton-on-Tees for Offers in the region of £185,000. 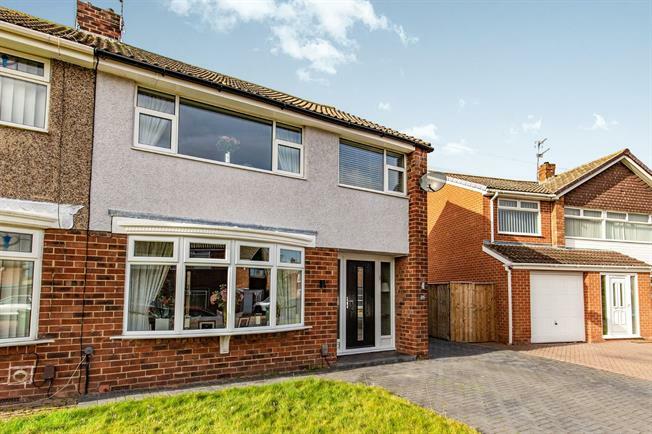 This gorgeous home is light and spacious, offering contemporary style fixtures and fittings throughout. With a generous size living room opening into the kitchen/diner, creating a relaxing flow, ideal for family living and entertaining. The rear garden is a great size, and offers opportunities to extend if required. With parking for several cars, this really is one we recommend early viewings.. Wide and spacious, with doors into the living room and kitchen, and staircase with stripped pine banister and spindles leading to the first floor. A bay window to the front, and double glass doors to the kitchen diner ensure this elegant room is light and bright. Decorated in relaxing neutral tones. Featuring a wall mounted electric fire in a sandstone effect surround and hearth. Contemporary and stylish, with high gloss grey wall and base units with wood effect contrasting work surfaces. Integrated appliances include Bosch electric oven and hob, microwave oven, fridge freezer, washer/drier, dishwasher and wine cooler. Stainless steel sink and drainer unit. Large under stairs storage cupboard. External door to the side. Dark wood effect laminate flooring. The dining area benefits from two floor to ceiling windows and double doors opening out onto the attractive patio, and offers lovely garden views. Dark wood effect laminate flooring. A large picture window to the front allows the light to flood in and creates a soothing atmosphere. With a built in double wardrobe proving hanging space and shelving. Picture window to the rear, with far reaching views over the playing fields and beyond. Double wardrobe. A generous single room with window to the front. Fitted wall shelves. Completely renovated, featuring a stylish white suite comprising of a P shaped bath with shower unit, sink set within a vanity unit and WC. Wall mounted tall radiator. Part tiled walls and tiled floor, with frosted window to the rear. Offering access to all first floor rooms, and into the loft space. Window to the side. The generous rear garden benefits from overlooking playing fields to the rear. Mainly laid to lawn, with an Indian Sandstone patio area for outside dining and entertaining, with remote controlled colour changing lights. A large workshop with mains electricity, shelving and storage sits to one side. To the front, the lawn has a low hedge boundary, with double block paved driveway providing parking for three cars.